What happens when you scale a regular Microsoft Surface Pro all the way up to 84-inches? 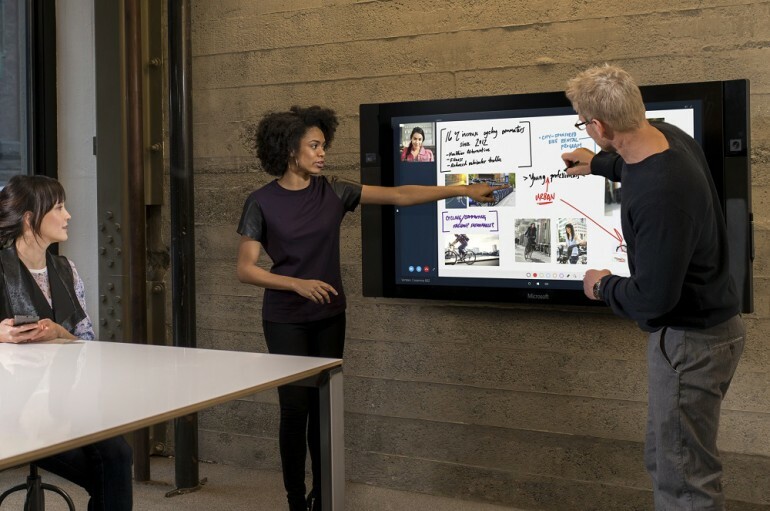 You get the new Microsoft Surface Hub, a massive All-in-One PC that appears to be designed for groups to work together on the same screen. It features a 4K display, WiFi, NFC, cameras, microphones, and Skype built right in. Which makes this the most elaborate whiteboard in existence, and potentially the most expensive. It is intended to be used for meetings and businesses; although that shouldn’t be a surprise. On some levels, it resembles the original Microsoft Surface; which has now been renamed the Pixel Sense, from back in 2008. That didn’t get as much traction from enterprise users as Microsoft had hoped, but this may fare a little better. No details on when it will be made available or how much it will cost just yet. But an 84-inch 4K display cannot possibly be cheap at all.